As a live music and small bar lover, sad news hit my hometown recently with the unexpected closure of Ruby’s Lounge. 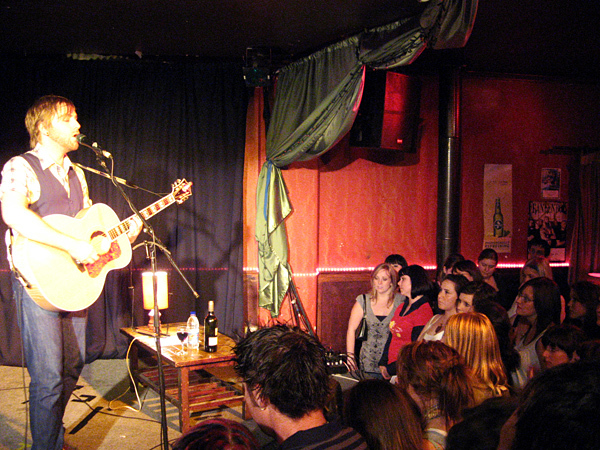 Ruby’s was the primary live music venue in Belgrave, as well as for the surrounding outer suburbs of Melbourne’s east and the Dandenong Ranges. It was once a true sticky-carpet rock-out institution that shared the character and spirit of the best venues from across Melbourne’s awesome live music scene. At the start of April, Ruby’s closed without notice and all booked gigs were cancelled. A small hand-made “For Sale” sign now appears in the front window. 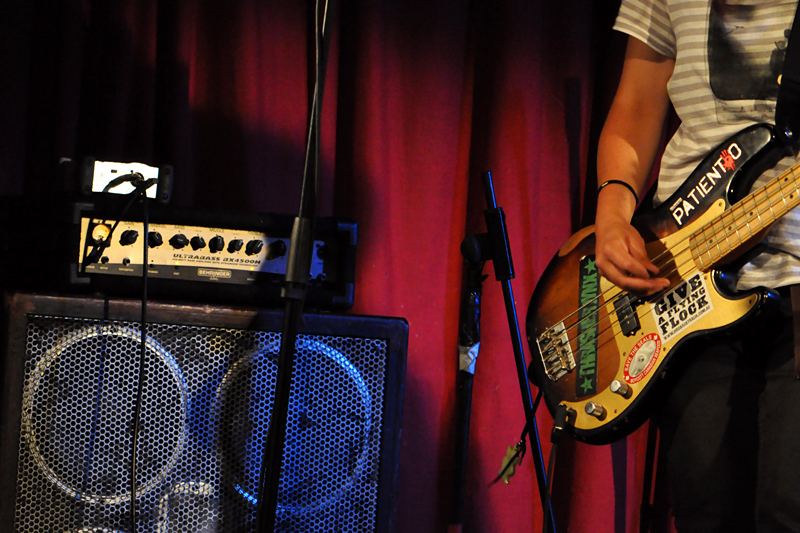 All is not lost for local music in the area, but nothing of the ilk of Ruby’s remains, for small indie grungy rock. Over the road from Ruby’s is the bogan chic of Bell Tavern with their Human-TripleM acoustic covers (*sigh*). Oscar’s Alehouse, the region’s best bar by far, provides a small corner for local artists with no cover charge. The little gigs there are always a winner…but Oscar’s can’t fit full bands or afford big name acts. More live music can be found down the hill at the Woolworths/ALH Group owned and pokies ridden Ferntree Gully Hotel and Royal Hotel. Thankfully, the Ferntree Gully Hotel’s bandroom, The Middle, is slowly bringing back decent acts to the outer eastern suburbs, including personal favourites of Grinspoon and Something For Kate, both of who are playing there over the next two months. However, none of these venues facilitates the pub rock essence of Melbourne’s small live music scene. Ruby’s was the gritty cool venue of the region. 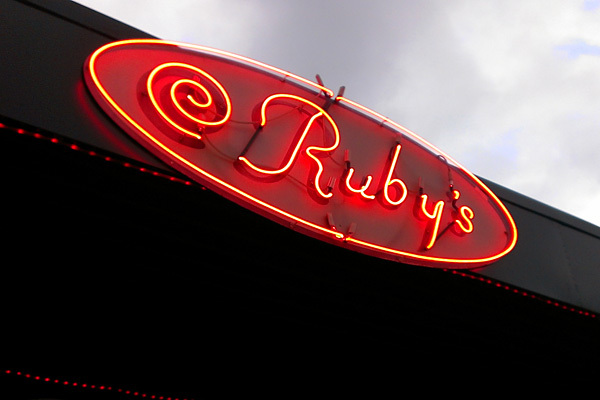 I wish I knew more about the history of Ruby’s. All I really know is that it has been a live music venue since at least 2003. 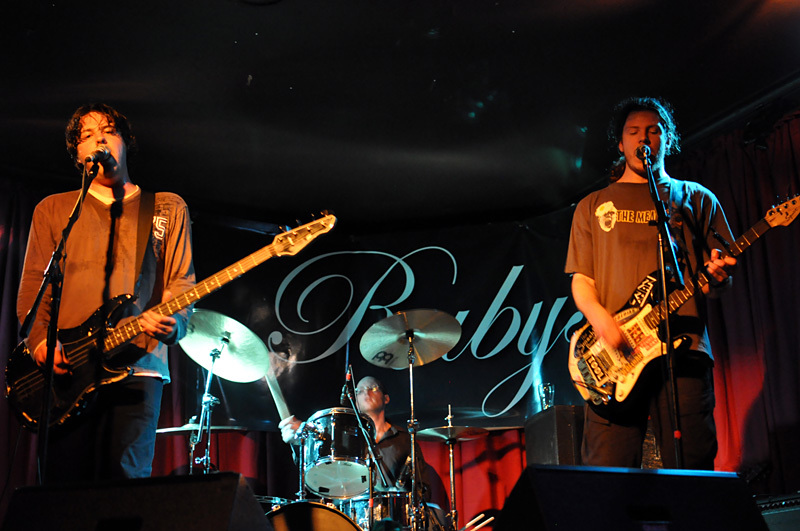 During it’s heyday, under the ownership of Oska and Imogen Truffaux, Ruby’s hosted quality big local names such as Radio Birdman, Josh Pyke, Bob Evans, Tex Perkins, Augie March, The Basics and Paul Dempsey…to name a few that do it for me. With the right people in place, this venue should NEVER deserve such classification/conditions. Melbourne trio, Charm, rock Ruby’s. Ruby’s owner since September 2007, Jason Land, posted a For Sale ad on his Facebook page back in April 2011. The venue has been in a downward spiral since. 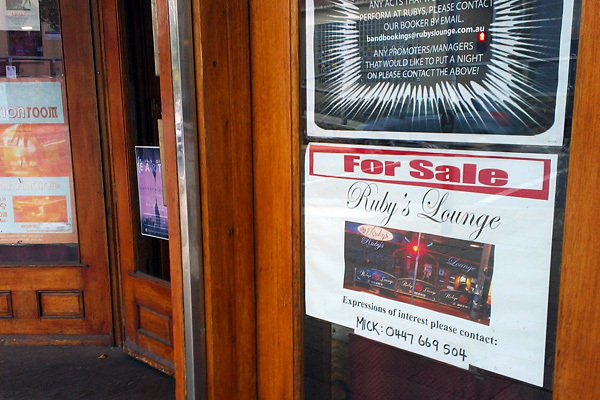 By the end of last year, Ruby’s Lounge was a skeleton of its former self. Sadly, it reeks of death by Victorian Liquor Licensing policies, out of which the SLAM Rally was born to fight the unsound and unreasonable regulatory link between live music and high risk activity. Over the last 18 months there had been several annoyances that hurt Ruby’s, from a patron’s perspective, which seems to be impacts from licensing conditions. 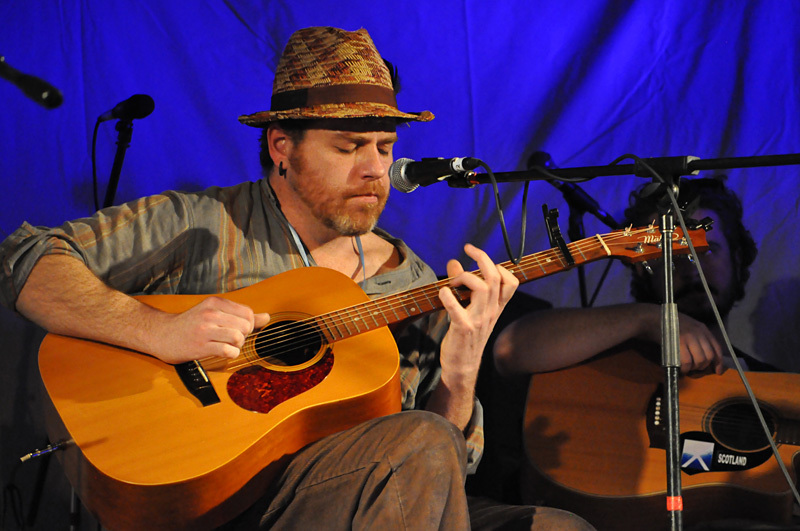 Coen Dixon shares his song writing skills during the End of the Line Festival. It started on entry, with an unwelcoming process. You were required to have your ID scanned, regardless, and you were asked which band you were there to see. But what If I was just there to check out all the music? I like live music, I want to head there for a night of random bands in the hope I might discover something new. Is it wrong if I don’t know who I’ll be seeing that night? That practice is directly opposed to the culture of live music. And the ID scanning is something I don’t recall experiencing at any other small live music venues. I’m always happy to display my ID, but having it scanned and recorded feels like a potential invasion of personal privacy, as well as evoking concerns about identity security risks. 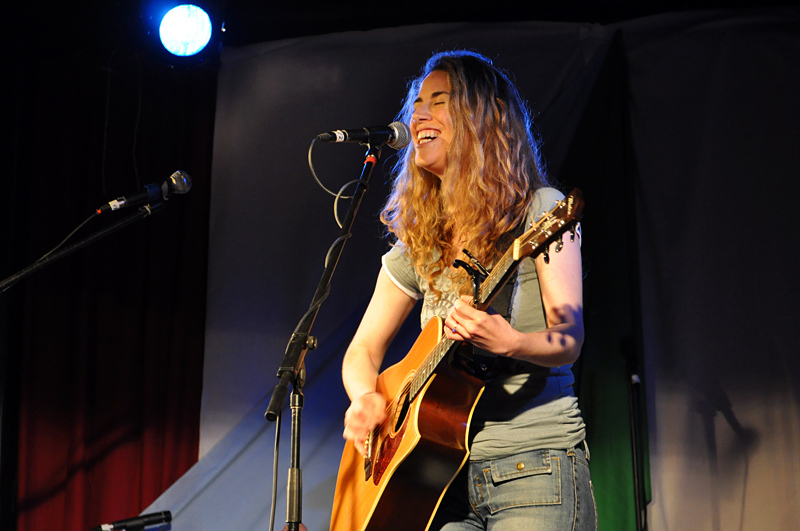 Carolyn Oates plays for Songwriters in the Round at End of the Line. As you entered and passed the bar, you were confronted with an overt display of the drinking rules: NO SHOTS AFTER 11PM, NO THIS, NO THAT…! “NO FUN”, it seemed to scream. The drinks selection was appalling in its limited and out-of-date range. Only two beers were on tap, Boags Draught and James Squire 150 Lashes, a so-called “pale ale”, both macro swill. Not a single craft beer was stocked. The best that a beer lover could get was one of the Coopers range – Coppers Red (Sparkling Ale), Green (Pale Ale) or Dark. The rest of the fridges were filled with boring bland lagers that hurt your head like VB and Corona. Advertised times were often wrong. One time would be listed online via Facebook or the ticket merchant and a different time shown out front of the venue. There had been reports of very limited community engagement or communication with local businesses. Belgrave thrives on community. Any business in the area will only succeed when it builds strong local connections. There were some events during this time that kept Ruby’s in the community’s hearts, namely Reverberation and the End of The Line Festival. Otherwise, unfriendly conditions like those mentioned above keep people away. As a patron, you already feel like you’ve done something wrong before you’ve even entered the building. So, what does Ruby’s need to live again? consultation with SLAM Rally supporters, Music Victoria or Australian Business Arts Foundation on addressing liquor licensing controls. Sure, easy said, but in this modern world’s current climate…such a venue will only survive with local passion and connectivity behind it. Whenever I went to Ruby’s for a gig I would spend most of the time staring into all its corners as I thought about how I’d improve the place if I owned it. I’d love to restore Rub’s to its full potential, making it a real bastion of Melbourne’s live music culture. Financially, and in terms of the required experience, the reality of that is far beyond me. 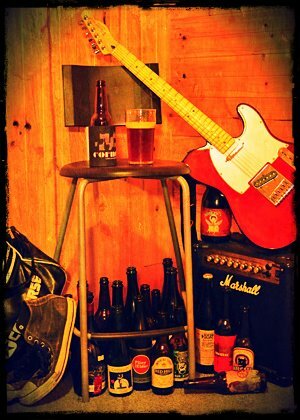 The venue needs someone with a passion for live music, community and good beer. I have all of that, but I’ll need to win lotto first. So instead, I’m left to hope that someone who knows Melbourne’s live music and bar scene can fall in love with Ruby’s and light up her life once again. …this Saturday (20th April 2013) is Record Store Day! If you love music is any way, I encourage you head along to a record store this weekend in support of music in all formats. Put your money where your ears are. Share the love for physical music releases, their artwork, packaging creativity/themes/concepts, and the joy of playing loud a fresh CD or vinyl for the first time! Let the music fill the room and beyond…and long live the record! Tags: bars, Record Store Day, Ruby's Lounge, SLAM. Bookmark the permalink. one thing that is never mentioned is that in ruby’s heyday the fish and chip shop next door used to stay open till after the last band played. often till twoAM. ruby’s bought a small mountain town alive, it would be sad to see it die. I’m kind of glad they’ve finally closed. They slowly took away all that made Ruby’s great in the first place. As a person that moved to the Belgrave because of the music scene, it’s been heartbreaking watching it go downhill to the point where I flat out refused to ever go back under the current ownership. I hope the owners of the building fix it to make it safe & new owners keep it as a live music venue under the same name. I’m with you there! It’s not looking good for Ruby’s though. The Rubys sign has gone. Here’s hoping real, good live rock music returns to Belgrave soon. Clearly it’s a different kettle of fish (keg of beer?) but I was pretty happy with the music friendly vibe at Flanagan’s (FTGully Hotel Irish bar) the other night when I played there for the first time. I had never been there, but while it’s not on the hill, it seems to be getting behind music so that’s a good thing. Ruby’s will be missed but. Indeed, a different kettle of fish. I enjoy FTG Hotel, both Flanagans and The Middle (minus the terrible beer choice… or non-choice). But Flanagans won’t attract the calibre of artist or music that Ruby’s once had the pull for, and The Middle is solely the night concert venue with an often hefty (for this region) ticket price. 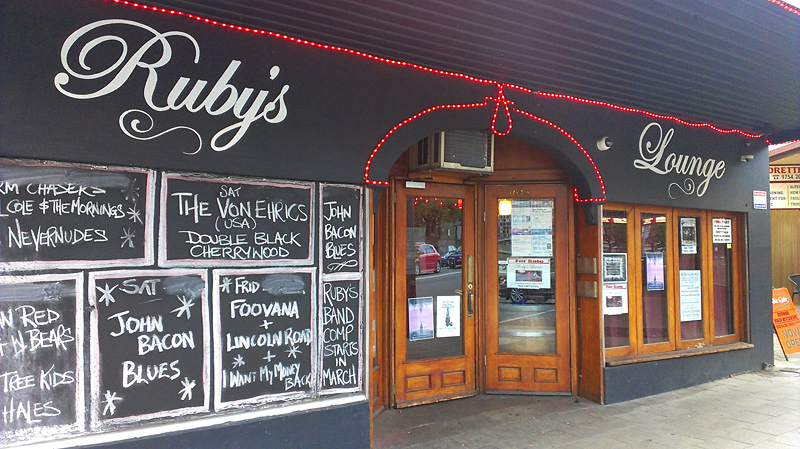 Ruby’s done right could be far better than both for Australia’s small live music scene. As a performer at Ruby’s my band are sad to see it shut down. The reason they asked which band you’re there to see is so they know which band to pay more. Most times we were paid by how many came to see us rather than a set amount, very difficult as a small cover band starting out and having to get friends to come to support you. The scanning of ids was one our supporters were concerned about also. We did enjoy playing there and now looking for other places to play if anyone knows some places let me know!